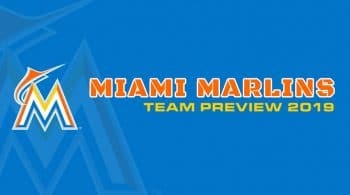 We will need to try and stay positive when evaluating the Marlins, but this is a tough group to get excited about at the moment. The Marlins are going through a rebuild, but they have yet to lay the foundation down. Instead they keep piling on old bricks like Curtis Granderson and Neil Walker. Both will be in the lineup against right-handers, and be platooned when left-handers are on the hill. Brian Anderson and Starlin Castro are the two more notable bats in the lineup, as they both had solid 2018 seasons. The upside is a bit capped for anyone in Miami right now, and there are not prospects joining the bunch to give us a glimpse into the future. Lewis Brinson continues to struggle at the major league level, and the same goes for Jorge Alfaro. It is looking to be awhile before we talk positively about the Marlins rotation. They ranked 25th in team ERA, and future starters are not looking to be in this current rotation. The farm system is also not on the brighter side despite them trading their stars over the last two seasons. The Marlins are bringing back the same name, so it is hard to expect much improvement. Jose Urena ate 174 innings last season, and pitched the best out of this group of arms. Urena has some potential, but overall is going to be a low to mid four ERA arm, with below average strikeout stuff. He, as many of these pitchers do, rely on the big ballpark and some luck in the BABIP department. Urena is projected to be a little worse this season, and it mainly has something to do with his batted ball stats catching up with him. Dan Straily missed a good portion of the season, but did throw over 100 innings. He struggled with allowing power, and the groundball rate was not a plus for him. 2019 is not looking to be kind for most of these names, and Straily is another one projected closer to a five ERA. Sandy Alcantara might be the most interesting name on the Marlins rotation, although Trevor Richards made some strides which we will need to talk about. Alcantara threw limited innings due to injuries, but has shown some positive stuff. He is 23 years old, and came over from the St. Louis farm system. Alcantara has fluctuated with having good and below average strikeout stuff in the minors so far. While we haven’t seen much major league sample size, we at least have a young prospect to talk about. Richards showed some positive stuff last season, with a 24% strikeout rate. He had a 10.5% swinging strike rate, but also had a below average walk rate. If Richards can bring in his control, there is a chance for him to be a fantasy sleeper. While the NL East is looking to be a much tougher division to pitch in, pitching half of his games in Marlins Park is going to benefit him. Wei-Yin Chen is a home run prone lefty, and the move to Miami has not been kind. Despite moving from AL to NL and from Camden Yards to Marlins Park, Chen has continued to struggle with the long ball.